I’m not entirely sure where last week went. If any of you find it, could you please return it to me? We had a wonderful time at Yarndale, and I’ll post later this week about our finished Telja sweater, but today we are releasing the first chapter of Something New to Learn About Helical Knitting. Woohoo! What will you find when you open your updated pattern file? There are photo tutorials for the basic method for working 1x1 helical stripes. 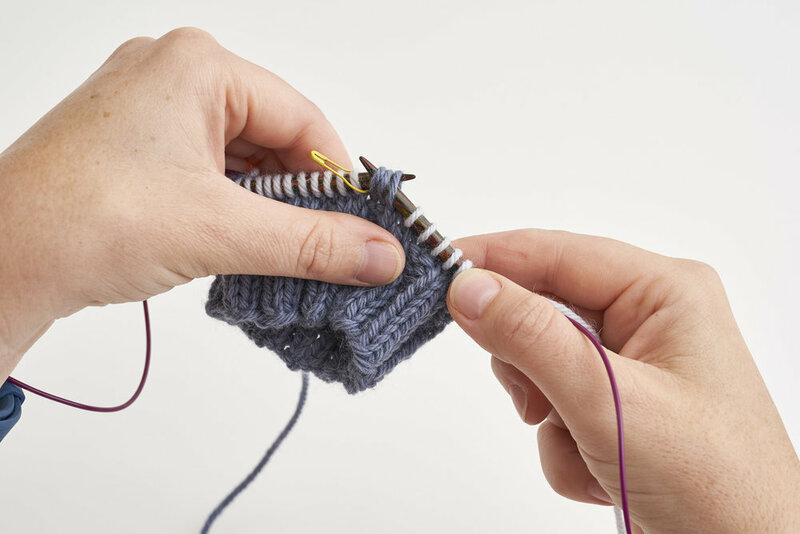 These instructions are the basis for what will follow, so even if you normally knit with double-pointed needles, it’s worth trying out the “slip 3” method, as it will broaden your possibilities later. I’ve written a full explanation of why I recommend slipping three stitches – this is the question I get asked most often about my way of working helically. If you are lucky enough to be able to maintain an even tension when you work helically to the end of the round, then definitely go for it! But I have found that many people find that tricky, and since one of the main reasons for working helically is to get a smoother, jog-free fabric, slipping three stitches seems worth the small extra effort. The chapter talks you through how to work helically on any needle, and then also includes photo tutorials specifically for working on double-pointed needles in sets of 5 and 4. I’ve also included instructions on starting to work helically right from the cast-on edge, in case you can’t wait to dive straight in! Finally, the pattern for chapter 1 is the Bramante cowl. 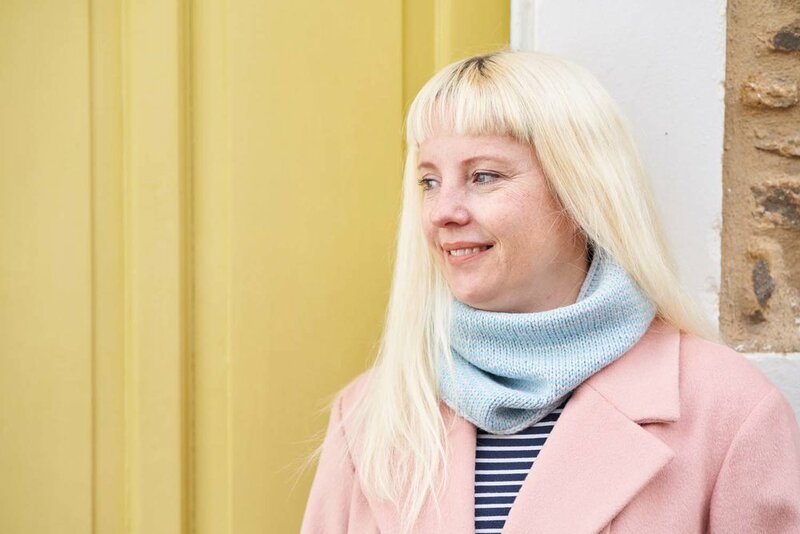 It’s a super-simple cowl that allows you to focus entirely on knitting helically, without anything else to think about. The cowl starts with a waste yarn cast on, and you work your helical 1x1 stripes to the desired length, before finishing the edges with an i-cord cast off at both ends. We have video tutorials on the way for the waste yarn cast on, as well as for basic helical stripes and the i-cord cast off, and they will be shared here when they go live. My kind friend Becki agreed to model with me for this collection, and as usual we had a giggle-filled time with Jim and our photographer, Jesse Wild. When she’s not an international knitwear model, Becki and her sister run my wonderful local fabric shop, Millie Moon, where I learned to make quilts and dresses and lots of other amazing things. Thank you Becki! It’s not too late to join the helical knitting party. You can purchase the ebook either from our website (which allows you to add your patterns automatically to Ravelry) or directly via Ravelry, and £13.99 will give you all four chapters, and seven patterns to take you on a helical adventure. The chapters are released fortnightly from today, and the ebook also includes a discount code for 10% off all purchases in our online shop until 27th November 2018 (not valid in conjunction with any other offer). Yesterday, I had a wonderfully helical afternoon with Felix (of the wonderful Knitsonik Stranded Colourwork Sourcebook and Playbooks). We went for a walk through the campus of the University of Reading, and we couldn’t resist visiting the double helix staircase at the chemistry department! I shall write properly about the pattern names I’ve chosen for Something New to Learn About Helical Knitting, and all of my double (and triple) helix staircase discoveries later in the week. Until then, happy (helical) knitting! All images © Jesse Wild.